First of all, I should say that I'm not even sure that Ryan Adams said this. That ole internet and its quotes, you never know if it's Abraham Lincoln or Marilyn Monroe or some random person on Tumblr. But after searching for some time to determine the true speaker of these words I haven't found much outside of Mr. Adams. So Ryan, thanks. My friend Melissa posted this quote the other day. I've seen it floating around, maybe I've even shared it before, but this time, it spoke to me. You see, I feel like for a good portion of my life I never really "got" this. And I think maybe that most people feel this way; you don't ever get it actually, but maybe it's not until your late twenties that it begins to at least feel like you kind of do. 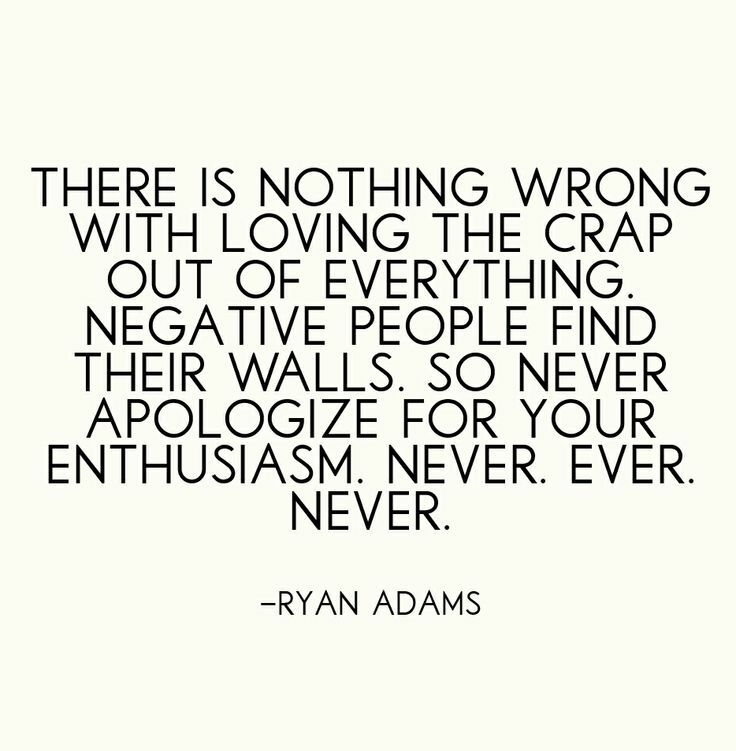 But I think about this quote, and I think about the idea of apologizing for enthusiasm or for liking this or for loving that...and I can see myself doing that, then. This is picking up from my previous post on the topic, but right now at this very point in my life I feel very happy and proud to be exactly who I am. I like what I like, I love what I love, and furthermore, I like that you like what you like. It's just all good, you know? I'll do me, you do you, and we'll meet somewhere in the middle. But if I quickly flip back to years past, fanning those pages backward until I land to "then," I see myself wanting to bend just a little this way, or shift my ideas a little that way, or tone down my enthusiasm. Like I thought being "too cool" was cool (it's not). So I just wanted to share this, for you and for me. Because in this (online) world that often feels a little negative and way too cool, wave that life-loving flag high girlfriend. If you love it, love it. Don't feel like you have to water anything down, because in the end you'll be the one smiling and happy (and maybe waving like a fool), but at least you won't be down there, too cool/too cynical/too annoyed to actually enjoy this one life with all you've got. Amen! Thanks for the late night thoughts, Dani--you rock! Oh my word. Seriously SO true. I'm enthusiastic and optimistic and I feel like most people take it as weird... No apologies here! It's so much better to allow yourself to see the positive side of things. Sure life has a lot of heartache, but we all get to choose what we focus on, right? It's perfect for me right now! I've posted in my blog some big news about my life, how much I feel good about my marriage, my job, about how much I'M HAPPY about everything, and suddenly, I heard some people saying things like: "calm down, when everything starts going so well, you know... It's not good..." WHAT? Gee, It's terrible! Love all of this, but especially the disclaimer of "who the heck knows who said this" at the beginning. Every time I see a random quote attributed to Marilyn Monroe or Audrey Hepburn, I shake my head. Love this and it's so true. I couldn't agree more. Well said Danielle. So good Dani...I find this even more I think as I get a little older...Now in my forties, it's strange (and sad!) how many women respond to exciting things I love or want to do. I'll never forget when I first started blogging how a few "friends" were like "BLOGGING!? Why would you do that? Who has time for that!?" haha. I tried to get away from the negativity, but it slimed me a bit! :) I really love your thoughts on this! Perfect timing reading this! I recently hung out with a good friend of mine and her neighbor and was severely brought down by how cynical and negative this person was. It seemed like everything I enjoyed she had a snarky comment about (music, movies, etc). Genuinely enjoying things is a lost art, and I think a sign of true joy in life. A cynical person is exercising their ego, assuming that if they don't like it it's inherently not good. Not everything is for YOU. There's beauty in that. I've found releasing myself from the grip of certain people has helped me realize this. I had some 'cool' friends who would cringe and loudly express their disdain for my music choices, or make fun of me for taking photos of everything because i freakin' love taking photos! And now I've stopped apologizing for what I love, or making excuses for why I like some pop music. Or for saying that burritos are my favourite thing ever but so is sushi and chocolate and coffee and... etc. etc. Great post, great reminder, thank you! Thank you for sharing the quote and your thoughts on it. I definitely find myself apologizing for things all the time--mostly things that are out of my control.It was actually pointed out to me a few years back by one of my cousins; he said it drove him crazy the number of times he heard me saying, "I'm Sorry." So of course I apologized for that too. But I'm learning to accept myself and accept that all the things I love, won't be loved by others. It is a hard journey for me right now. As I try to please other people. I am learning to listen to my heart more and more and I hope that one day soon, I'll be able to say with confidence that I don't need to apologize for loving the things that I love!